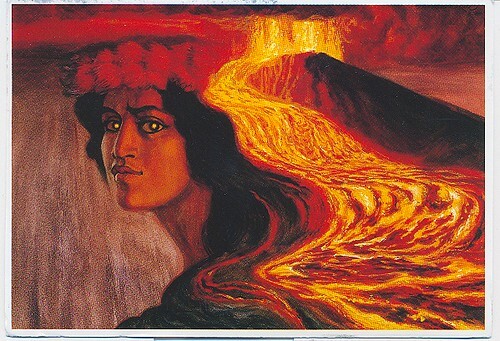 Hawaiian legends tell that eruptions are caused by Pele, the beautiful Goddess of Volcanoes during moments of anger. Pele is both revered and feared; her immense power and many adventures figure prominently in ancient Hawaiian songs and chants. PELE – the Hawaiian (Polynesian) goddess of Fire and volcano, was born in Honua-Mea, part of Tahiti. She was one of a family of six daughters and seven sons born to Haumea (a very ancient Earth goddess) and Kane Milohai (creator of the sky, earth and upper heavens). She was exiled by her father because of her temper, and for fighting with her elder water-goddess sister Na-maka-o-Kaha’i, whose husband Pele had seduced. Pele’s oldest brother, Kamohoali’i, the king of the sharks, gave her a great canoe, in which she carried her little sister, Hi’iaka (or Hi’iaka i ka poli o Pele) who is known as the patroness of hula dancers, in egg-form, over the seas eventually finding Hawaii. When Pele got to Hawaii, she first used her Pa’oa, or o’o stick on Kauai — striking deep into the earth but she was attacked by her older sister and left for dead. Pele recovered and fled to Oahu, where she dug several “fire pits,” including the crater we now called Diamond Head, in Honolulu. After that, Pele left her mark on the island of Molokai before traveling further southeast to Maui and creating the Haleakala Volcano. Namakaokahai, Pele’s older sister, realized she was still alive and she went to Maui to do battle. Finally, the epic battle ended near Hana, Maui, where Pele was torn apart by her sister. Legend has it that her bones remain as a hill called Ka-iwi-o-Pele. Upon death, she became a god and is said to have found a home on Mauna Kea, on the Big Island of Hawai’i. Pele dug her final and eternal fire pit, Halemaumau Crater, at the summit of Kilauea Volcano. She is said to live there to this day and is thought to be happy there because it was the Navel of the World, Ka Piko o ka Honua — were the gods began creation. She causes earthquakes by stamping her feet and volcanic eruptions of fiery devastation by digging with the Pa’oe, her magic stick. Sightings of Pele have been reported all over the islands of Hawaii for hundreds of years, but especially near craters and her home, Mount Kilauea, one of the most active volcanoes on Earth. Pele is known for her violent temper, but also for her common visits among mortals. She is said to appear either as a tall, beautiful young woman or as a very old, ugly and frail woman.